Wild thing is a subwoofer kit consisting of 4 bass drivers arranged on top of one another. 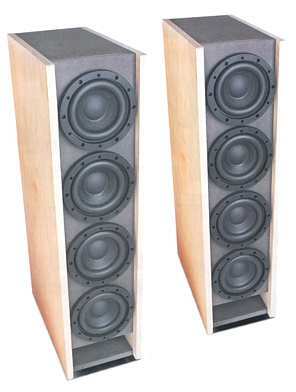 The bass reflex subwoofer contains 4 Monacor Raptor 6 drivers originating from the automotive range. From a functionality point of view this makes no difference. The Raptor shows an excellent workmanship and an immense excursion. The use four drivers results in extremely high dynamics. 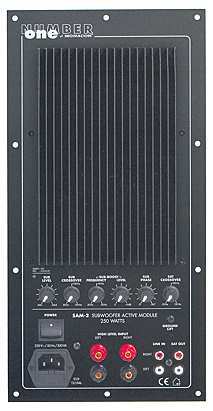 The subwoofer is driven by the powerful SAM-2 subwoofer module (pictured below right). In conjunction with superior satellites, like e.g. Lightning, 2 or 4 subwoofers per listening room are recommended keeping in mind that the subwoofers should be placed symmetrically.